Built around a 17th Century manor house, Weetwood Hall is set amid 9 acres of woodland and gardens. Less than 4 miles from Leeds city centre, 10 minutes from Leeds Bradford Airport and only 30 minutes from the Dales, it is ideally located for exploring the beauty of Yorkshire. 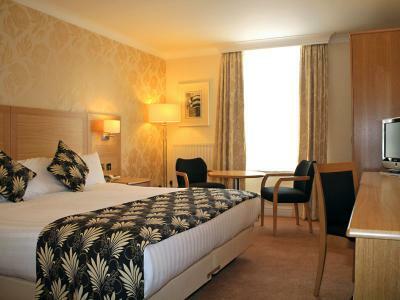 Feature rooms offer king beds, 42″ LED TVs and Cafissimo coffee machines. Convive brings a taste of the Med to God’s Own Country and the Stables pub serves award-winning Cask Marque ales. Guests enjoy complimentary access to David Lloyd Club and Cookridge Hall Health, with transport provided at designated times. There is free high-speed Wi-Fi and ample, free parking on-site. Bedrooms have been designed in a contemporary style and range from small junior double rooms, to individually styled, spacious feature bedrooms with four poster beds and 42" LED TVs (offering Sky Sports channels) located in the original 17th Century manor house. Room service is available. 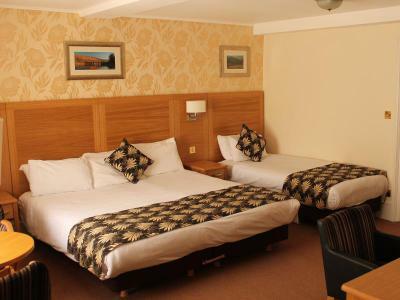 With stylish and contemporary décor, the standard double room is compact but perfectly formed. 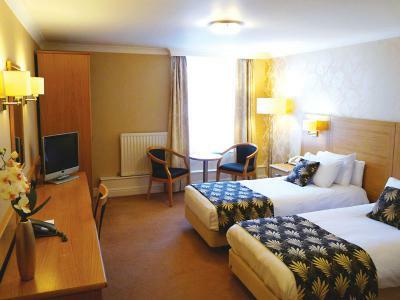 With a comfortable double bed, this bedroom offers fantastic value for money, with everything you need for a convenient stopover, the standard double room is ideal for business or leisure. Upgrade to a superior double room with plenty of space and uniquely designed modern décor. All rooms have a king size bed (which can also be split into twin beds on request), a work space and refrigerator. A limited number of rooms are also interconnecting. 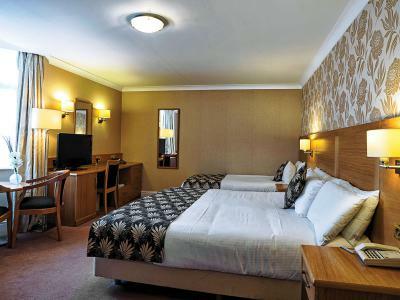 Large and well equipped bedrooms with modern décor for a comfortable family stay. 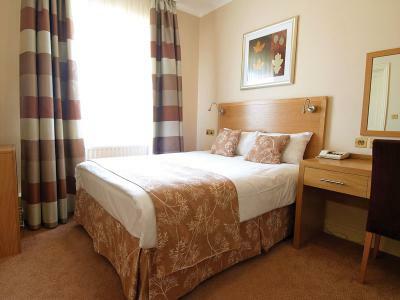 All rooms have a double bed and a single bed, an additional z bed can be added and cots are available on request. All rooms are equipped with a refrigerator. Maximum occupancy of these rooms is up to 2 adults & 2 children (12 years and under). Situated in the 17th century Manor House with modern decor offering a king size bed (which can be split into twin beds on request). All rooms are spacious and an ideal retreat after a long day, they are also equipped with a refrigerator. Situated in the 17th Century Manor House with modern décor, offering families a comfortable stay. 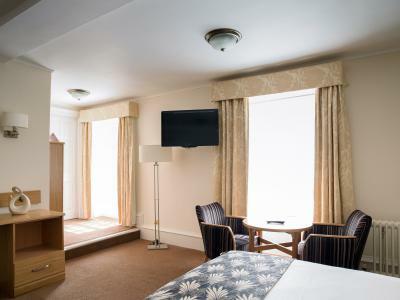 Each room has a king size bed and a single bed, a sofa bed can also be used for a second child and cots are available on request. There is also a refrigerator. The maximum occupancy for each room is up to 2 adults & 2 children (12 years and under). Uniquely designed rooms situated in the 17th century Manor House, with upgraded facilities and space to unwind. 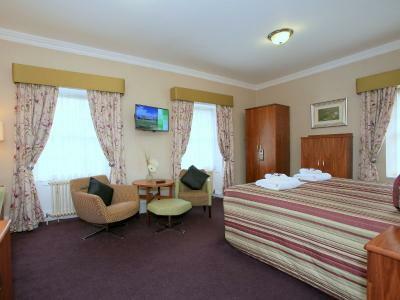 Each room has a king size double bed, a Caffissimo coffee machine, ipod docking station and a refrigerator. 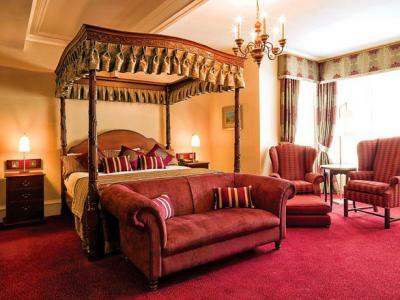 Opulently styled rooms situated in the 17th century Manor House with a beautiful four poster bed. With upgraded facilities including a Caffissimo coffee machine, ipod docking station and a refrigerator. These rooms are ideal for special occasions and romantic getaways. At the roundabout, take the third exit onto Whitehouse Lane. Turn right onto Scotland Lane. Follow for 1.6 miles then turn left onto Brownberrie Lane. At the roundabout, take the second exit onto Station Road. Turn right onto Troy Road. Continue onto Low Lane. At the roundabout, take the first exit onto Ring Road/A6120. Follow for 1 mile. Enter the next roundabout. Weetwood Hall will be on the left. Exit the M1 at Junction 43 onto the M621. Exit the M621 at Junction 3 and head for the city centre. Follow the signs for 'All Loop Traffic.' Stay on the loop until you see signs for Leeds University/A660. Drive past the University. Weetwood Hall is 3 miles further on, just before a large roundabout opposite Lawnswood School. You're sure to find convives (French for 'dining companions') here at Weetwood, where the menu offers Mediterranean meats and cheeses, artisan sharing boards, small plates, hand-stretched pizzas, and pasta dishes. There's a strong selection of mains, too, and plenty of classic desserts naïve to the Med. Or just savour a cup of authentic Italian coffee served with home-made biscotti. Convive is partnered with Mediterranean restaurants across Europe creating inspiration through innovative chef swaps. A member of the Yorkshire and Humber Regional Food Group, Weetwood selects the finest of fresh, local ingredients to prepare each dish; from the Yorkshire Dales Meat Company, to family-run Cryer & Stott Cheesemongers. Located in the original cobbled courtyard, this on-site pub was once the stable block of the 17th Century manor house. Today, guests can enjoy traditional pub food and award-winning Cask Marque ales. Dishes include a delicious range of mains fresh from the Yorkshire Baker, specialising in handcrafted, artisan foods, and a tasty choice of gourmet burgers. Tuck in to hearty pub food whilst watching the latest sporting fixtures in high definition. A delicious Yorkshire buffet breakfast, offering both cooked and Continental options, is served daily in the Woodlands Suite. The restaurant also provides a stylish setting for a three-course carvery on Sunday afternoons, with a choice of traditional roast dishes, served with Yorkshire puddings, potatoes and seasonal vegetables. In the summer, dining at Weetwood Hall reveals an altogether different flavour. Take a seat in the fresh open air – sunny or shade – and dine al fresco. Guests of Weetwood can make the most of the fine weather - there's a retractable roof (within the gardens) at Convive, or you can take your Cask Marque ale and succulent Yorkshire steak outside into the Stables pub's charming cobbled courtyard. Don’t miss the opportunity to indulge in afternoon tea whilst staying in this glorious setting – savour homemade scones with fruit preserve and cream, sandwiches, cakes and a pot of tea. Both traditional afternoon tea and champagne afternoon tea are available to order and can be enjoyed in the hotel lounge. Afternoon tea can be booked in advance, at a special price, when booking your room via ClassicBritishHotels.com. The unique surroundings of Weetwood Hall present a wonderful setting for private dinners and celebrations. The hotel caters for reunions, anniversaries, family gatherings, birthday parties, charity and club events, and business dinners. Choose from a range of private rooms, including Jacobean rooms in the 17th Century manor house with ornate ceilings and attractive fireplaces. Call Classic British Hotels on 0844 967 0984 for advice and let us help you organise a memorable private dinner. 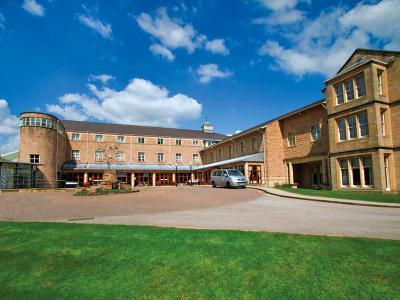 Guests have complimentary access to Cookridge Hall Health and Fitness – a short 2 mile drive from the hotel, with transport provided at designated times – including a 20-meter indoor pool; a state-of-the-art Technogym gymnasium spread over 2 floors; a health and beauty spa; a children's pool; and a crèche. A full range of spa treatments, using Dermalogica and Environ products, are available to book. Guests have complimentary access to David Lloyd Gym and Club - a short 2 mile drive from the hotel, with transport provided at designated times - including indoor and outdoor swimming pools; a state-of-the-art gymnasium with zoned areas; innovative exercise classes like virtual cycling and Fierce Grace yoga; tennis, badminton and squash courts; a health spa (does not offer spa treatments); a beauty salon; children's splash pools, classes and events; a soft play area and nursery; and a sports shop and cafe. Once home of 'The Yorkshire Princess'... The family seat of the Earl and Countess of Harewood, this Georgian mansion house was built in the mid-18th century for the wealthy trader Edwin Lascelles using money that his father had made from owning tens of sugar plantations and thousands of slaves across the West Indies. Harewood House has been home to the Lascelles family ever since, reflecting the changing tastes and styles of the past 250 years. Employing the finest craftsmen of the time, Harewood was designed by pre-eminent architects John Carr and Robert Adam. Adam was one of the most fashionable architects and interior designers in Georgian England. His innovative style of neo-classicism ('Style of the Brothers Adam') favoured a lighter, more decorative aesthetic. Local-born Thomas Chippendale designed much of the furniture at Harewood; his greatest masterpiece is the Diana and Minerva commode that now stands in the State Bedroom. In the 1840s, Sir Charles Barry (architect of the Palace of Westminster) remodelled much of the House, and created the formal terraces and parterres. Harewood was home to Princess Mary, HRH The Princess Royal, from 1929 until her death in 1965. The only daughter of King George V and Queen Mary, The Princess married Viscount Lascelles in 1922. Together, they introduced many modern amenities to the House. Her love of Yorkshire and the affection that the people of Yorkshire felt for her, means that she will always be remembered as 'The Yorkshire Princess'. At the age of twenty two, JMW Turner came to Harewood as a young artist and left a legacy of watercolours that remain in the collection today. The 'painter of light' was not the only artist associated with the House, however, Thomas Girtin, a friend of Turner's, John Varley, John Piper and Roger Fenton all stayed at Harewood over the years. Masterpieces by Reynolds, Gainsborough, Lawrence and Richmond are on display throughout the House, as well as a fine collection of Sèvres china. The Terrace Gallery, a dedicated exhibition space for contemporary art, has exhibited works by a wide range of artists, including Antony Gormley, Sir Sidney Nolan, Andy Goldsworthy, David Hockney, Andy Warhol and Dame Elizabeth Frink. In 2011, Sir Jacob Epstein's Adam was restored to its former glory in Harewood's entrance hall. This double sense of the historic and the contemporary make Harewood not only a rich tapestry of England's history, but a fabric that is forever being reworked with new yarns. Opening times vary. Please check website. Set amidst ‘Capability’ Brown parkland, Temple Newsam is a Tudor-Jacobean mansion that was the birthplace of Lord Darnley, the husband of Mary Queen of Scots. It is the location of one of the largest working rare breed farms in Europe and houses one of the most important collections of decorative arts in Britain. Established in 1954, the Yorkshire Dales covers an area of 680 square miles, straddling the central Pennines in North Yorkshire and Cumbria. There is an abundance of wildlife, with nationally and internationally important habitats, and natural beauty, including deep valleys (dales), striking limestone scenery and spectacular waterfalls. Weetwood Hall has some of the finest conference and event facilities in the North of England and offers easy access to the M1, M62, M621 and A1 motorways. Its conference centre features 35 meeting spaces, with seating for up to 200 delegates (theatre style). The very latest AV technology, including an extensive range of in-built technical equipment and a web data conferencing suite, offering a fully interactive environment for remote meetings and training, is available. Stretching over 100 acres, Sports Park Weetwood, adjacent to the hotel, offers an abundance of sporting facilities on-site, featuring grass and floodlit artificial pitches. With so much space at your disposal, team-building is on a whole different scale.